With the premiere of the upcoming six-part A&E docuseries, Who Killed Tupac, just a few weeks away – it begins Tuesday, November 21st – you’ll soon start to see promos for the show, and, with greater frequency, you’ll see me out and about talking about it as well. …the attorney for Trayvon Martin‘s family, Michael Brown, Tamir Rice, and many others throughout the country involving the senseless murders of unarmed African-Americans and people of color. The four of us put our best efforts forward in the docuseries, determined to seek justice for this long-unsolved case. 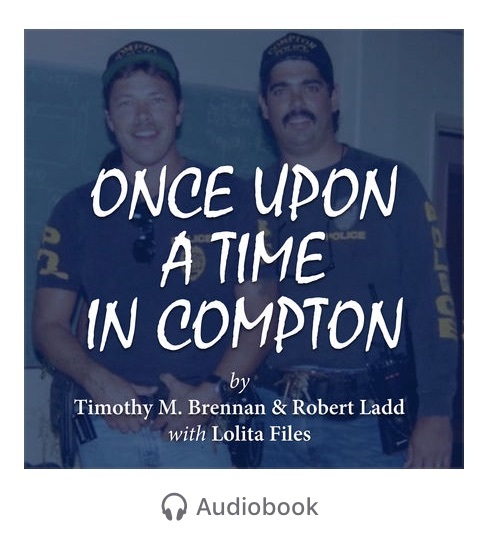 …written with former Compton gang unit detectives Tim Brennan and Robert Ladd about their nearly twenty years working the streets of Compton and their first-hand involvement in investigating the Tupac murder case. We also talked about how my career path led me to doing the book with them, my regard for Tupac, and what to expect in the upcoming A&E docuseries. T.K. was so much fun. She kept trying to crack me to give up answers, but (as you’ll see in the interview), I’m pretty good at bobbing and weaving, lol. Be on the lookout for more to come as the premiere date for the docuseries gets closer. Come Check Me Out At The South Florida Book Festival! This weekend I’ll be at the South Florida Book Festival in my hometown of Fort Lauderdale, FL. Tomorrow night I’ll be at the “Evening With The Literary Stars”” from 7pm-9:30pm and Saturday I’m featured from 1:30pm-2:30pm talking about my newest book, Once Upon A Time In Compton (written with former Compton gang unit detectives Tim Brennan and Robert Ladd). Friday night is a paid event and Saturday is $FREE.99! Come thru and check me out! Click HERE to visit the South Florida Book Festival website for tickets and more details. Check Out My Interview on Neil Haley’s Total Tutor Show on BlogTalkRadio.com! Listen to my recent interview on Neil Haley’s BlogTalkRadio.com show Total Tutor where I discuss my new book, Once Upon A Time In Compton, co-authored with Tim Brennan and Robert Ladd, about their time on the Compton Police force as gang unit detectives and some of the major moments in pop culture they were a part of, from knowing NWA in their early years, the LA riots, investigating the Tupac and Biggie murder cases, and more. We also talk about the upcoming six-part A&E docuseries Who Killed Tupac? in which I’m featured and am also a producer. Check Out Our Interview On Book Circle Online! Today my co-authors Tim Brennan and Robert Ladd and I appeared on Book Circle Online to talk with host James Lott, Jr. about our new book, Once Upon A Time In Compton.